OK, I think this could be my final post about this bridge. On Thanksgiving, The Oregonian reported that the 82nd drive bridge is now open, after being closed since August of 2006.Â We quickly confirmed it here, and got on the bikes for an early morning ride.Â We did so for two reasons. One, we wanted to be one of the first across it after it opened, and two, well it is was Thanksgiving and we were planning to overeat just a little. It was nice to be able to ride across it and, coupled with the newly paved path from the bridge along the river, its a quiet ride all the way to the Oregon City Shopping Center. I wonder if they would have fixed the bridge if it wasn’t needed for the sewer line? This entry was posted in Bicycling & Fitness, Spanning the Bridges on November 28, 2008 by golinielcomblog. This just in, Park Place Bridge is still closed. Still patiently waiting for the Park Place, bike/pedestrian bridge over the Clackamas river to re-open. I wrote here, why and when the bridge closed. And, here, about its progress after seeing they have put a nice banner pointing to their website. Though from up top, it has never appeared that anything has happened. From below, looks like the old burnt wooden pillars are gone. Replaced with two nice simple concrete ones, at least on the south side. This entry was posted in Bicycling & Fitness, Spanning the Bridges on November 22, 2008 by golinielcomblog. We are in a unique time where we can decide upon the design of two new bridges in Portland. Not new really, as they are replacements, but we have the opportunity to make them new, and interesting, and useful for many years to come.Â It has been 30 years since a our lastÂ significant bridge project (Sauvie Island bridge doesnt count as significant) and I hope we don’t let it slip by and build some nondescript flat deck concrete structure.Â Dylan Rivera wrote a great article in the Oregonian, titled “Can we afford pretty?”Â It is my hope that our new bridges add to the beauty of our area, like the St. Johns, not add to the web of concrete like the Marquam,Â and George Abernathy. And of course, I want the bridges to be traversable by bikes.Â Dylan’s article also included nice drawings of all the bridges that connect Oregon and Washington, and, as I looked at them, I began to think about which bridges can be crossed with a bike. I dont have the graphics, but I can list them. 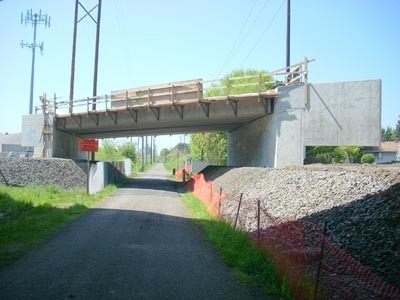 Interstate Bridge – The bicycle accessÂ is not great, but stay on the sidewalk and you can make it across. A little narrow, and not what most would call safe or fun.Â Perhaps a newer bridge will use some of the knowledge we have gained over the years, to make this trip a little safer and more appealing to bike riders for years to come. Glenn Jackson – Easy access from the bike paths in Oregon, there is a path separated by concrete walls, between the North/South lanes.Â Noisy, and can be very windy, but a safe ride. this is the newest bridge, and I think, the safest one to ride. Lewis and Clark Bridge – I first rode this bridge with a buddy nearly 30 years ago. Since then, we have crossed it during the Seattle to Portland ride put on by the Cascasde Bicycle Club.Â For the ride they had pace cars to accompany groups of riders. If I rode it solo again, I would stay on the sidewalk. Astoria-Megler Bridge.Â One very long bridge.Â Again, I first rode this bridge on the return route from Canada, with my buddy so very long ago.Â I don’t remember much about that ride over the bridge, but seems to me we might have walked on the sidewalk for part of that ride.Â It was in the 70′s, and the term bike-friendly had not yet been invented.Â Our last ride across this bridge was summer of 2008, with Cycle Oregon. We did ride on the roadway, in a white laned shoulder that has been slightly widened recently.Â We were not escorted across, as I thought we might have been, but with so many riders on the road, the presence of a bike didn’t appear to surprise the drivers, so it at least felt safe. I dont know if I would want to ride that entire bridge if I were not in a group. Bridge of the Gods - there is a nice 80 mile loop that includes the Glenn Jackson and the Bridge of the Gods.Â There used to be a 50 cent toll, but I have heard that has since been rescinded.Â Honey hates riding this bridge, as it is pretty high up, and the decking is steel grating, and at bike speed the grate seems to disappear when you look down, so all you see is the river far below. You do ride on the deck, in the lane, but the traffic is slower, you are pretty visible, the bridge seems short and the drivers are usually patient. Hood River Bridge, The Dalles Bridge, Sam Hill Bridge and Umatilla Bridge. – I lump all these together, since I have not ridden my bike across them, nor am I sure you can even ride over them, safely or not. I guess we will have to find out if riding a bike over these remaining bridge are at all possible. Bike traffic is going to continue to increase in the years to come.Â It would seem such a mistake if they are not adequately planned for with our new bridges. This entry was posted in Portland, Or, Oregon, Spanning the Bridges on November 9, 2008 by golinielcomblog. 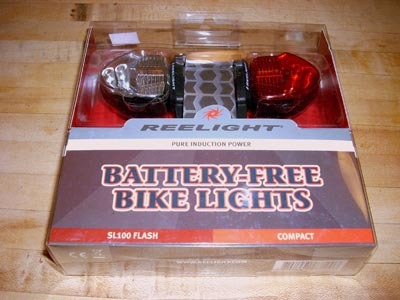 The “no battery” reelight bike lights work for us. 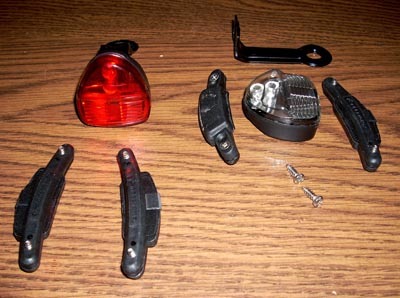 Some time ago I wrote a post about these cool danish bike lights. Honey saw the post and took the bait.Â That Christmas, Santa left me one set of the lights, thinking that if they were worthwhile, a set would appear for Honey as well. 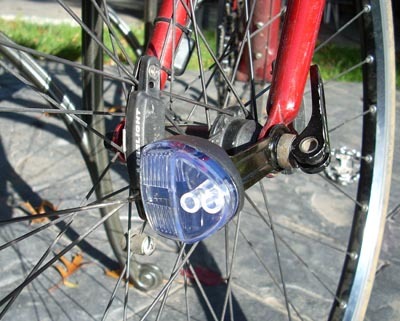 They have been on my commuter/rain bike since then.Â Each time I get on the bike, they are there, consistently blinking.Â They passed our test, proving to be bright, sturdy, dependable, andÂ maintenance free. We ordered some for Honey, choosing to get them installed by the daylight savings time darkness instead of waiting til Christmas. The kit contains a front (red) and rear (white) light, brackets to hold the lights to the axles, and two magnets for each wheel that are installed just like installing the magnet for the cyclometer. The bracket for Honeys bike required some additional reshaping since her touring style forks are a little wider.Â The light had to be shifted farther inward, since there must be less than a quarter inch clearance between the magnet and the light. My cyclometer is installed on the rear wheel as well and I found that it was in the same alignment as the light, and the addition of two more magnetic sensors to the odometer caused some really fast and false readings, so I had to rework the cyclometer a bit. It is much better to have the cyclometer on the front, so that they can be on opposite sides of the wheel such as on Honeys front. It really only takes about 15 minutes to install, it is pretty simple and only requires one phillips screwdriver. These lights are really an addition to the lights arsenal you need.Â They are flashers, meant to make you visible, not to help you see the road. Plus, because they are mounted on the axles, they are a little low for maximum visibility. 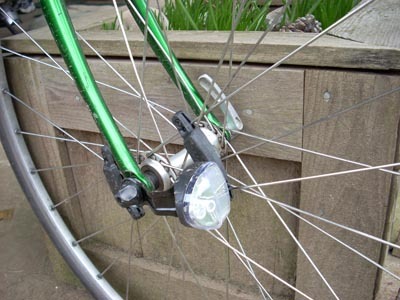 And, they will take a little adjustment when the tire is removed since they are held in place with the quick release levers.Â But they are pretty bright, and once installed, you will never leave home without them. 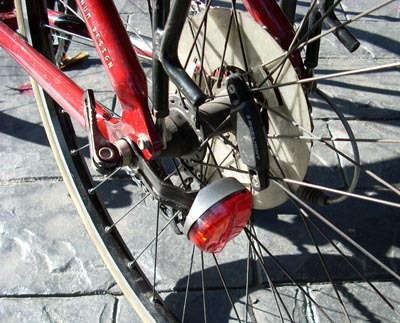 This entry was posted in Bicycling & Fitness on November 2, 2008 by golinielcomblog. SE Portland bridges you can’t yet use. 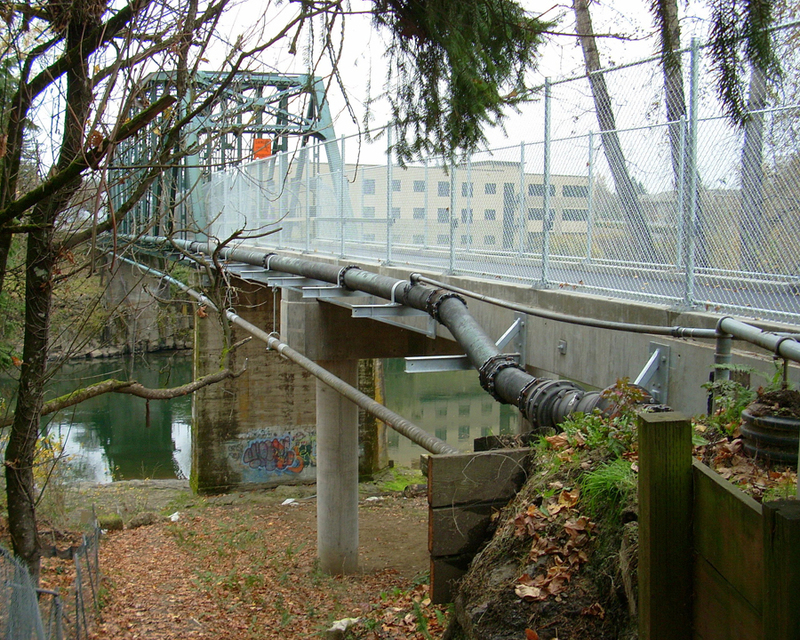 On our recent ride in Gladstone and out Springwater corridor we found three bridges you cant yet use. 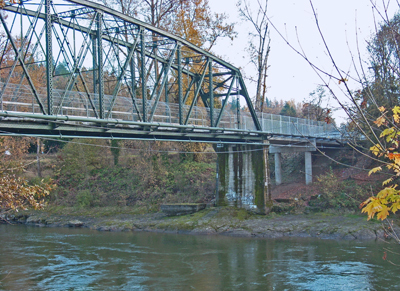 The first one is the still closed Park Place bridge in Gladstone, over the Clackamas River. My last post on this bridge was back in February, other than this festive looking banner, I cant see anyÂ sign of activity related to fixing this bridge since that time. 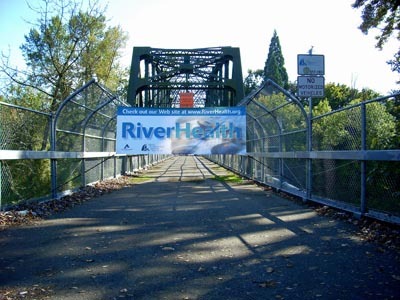 But, according to the site, www.riverhealth.org, ” Repair work on the 82nd Drive Bridge over the Clackamas River near High Rocks is expected to start in late July or early August. The bridge will reopen for public use by the end of 2008.” Hmmm, ok I gues I will have to go ride by again. Then, we were out the Springwater, it was a clear and calm day, perfect for a ride. And we came across a construction project that has closed this bridge. 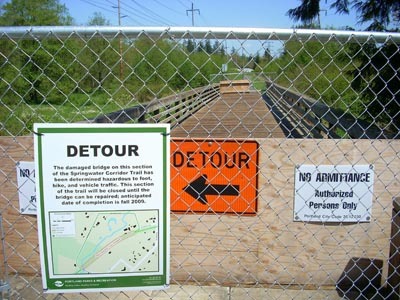 Apparently the work is to repair the bridge, although it seems odd that the bridge would need maintenance repairs so soon.Â Anyway there is a good detour that is well signed and really kind of a nice ride, and not an area you would normally ever see, so that was a good detour. Also on the Springwater corridor, you can ride under the new light rail overpass just west of where you also ride under I-105.Â Ok, this bridge isn’t closed as much as it is not yet finished and open. And, you can only ride over it if you are using the light rail, but still….. 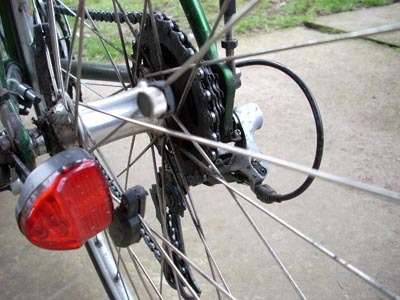 This entry was posted in Bicycling & Fitness, Portland, Or, Oregon on November 2, 2008 by golinielcomblog.